December 2012: At my first book signing. 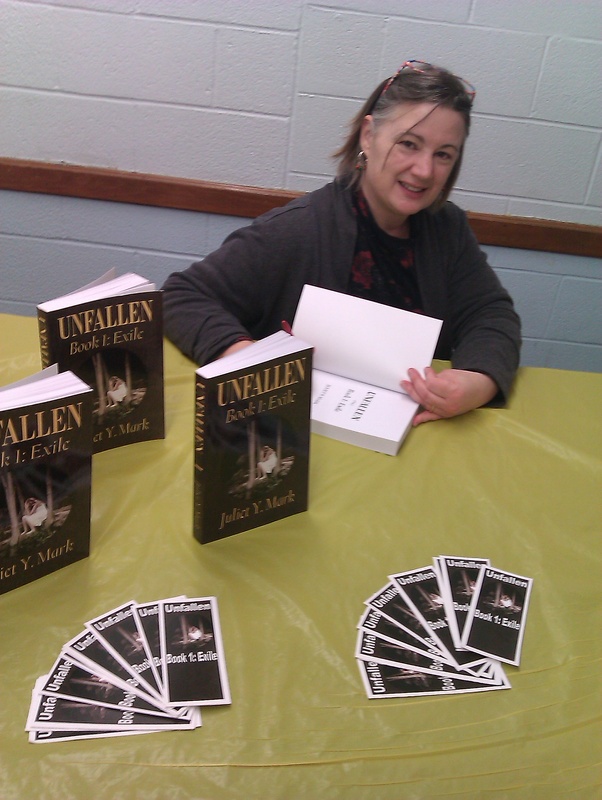 In August of 2006 I sat down at my computer and began to type the first draft of my first novel Unfallen: Exile. Eight months later I added the words “The End” to the last page of that manuscript, which contained a whopping one hundred fifty-five thousand words. Fast forward five years—my editorial team tactfully told me that I had too many sub plots. I tearfully waved goodbye to some minor characters and parted ways with four thousand words. So I was genuinely surprised when the Kirkus Indie review of Unfallen opined that my promising novel is “slightly overstuffed”! Upon reflection I had to admit it might be slightly so and after a week of intense introspection I traced my propensity to give my characters action-packed lives back to my own life choices. My tendency to overstuff began in High School. I needed nineteen credits to graduate. I matriculated with twenty-seven. I’ve often worked two jobs at a time, occasionally even three, to support myself. I’ve had scads of hobbies, a couple of children, a few careers, and my fair share of real-life drama. At fifty plus years of age I like to think of this as living life to the fullest, though for the past couple of years whenever I’ve considered adding a blog to my “to do” list I’ve balked…until now. Clearly I could no longer resist the temptation to blog now that I have the perfect title inspired by “my” Kirkus Indie review. “My Overstuffed Life” is the place where I’ll record random snippets of my life experiences and/or opinions, in no particular order and in no more than three paragraphs per entry—I promise! Welcome!